What would you wear on a trip to space? How might we decorate the interior of a commercial spaceship? How might everyday objects need to be adapted for use in microgravity? Designers at the University of Hertfordshire have been asking these questions, and have designed objects, interiors, and clothes for future space tourists. Space has been identified as a key research theme for the university, and staff and students in the School of Creative Arts are addressing this theme by focusing specifically on design for weightlessness. We are entering a New Commercial Space Age in which artists and designers are beginning to engage with the possibility of creating work for or in a weightless environment. Commercial space agencies plan to transport paying passengers into orbit, and designers have begun to develop plans for space hotels. Passengers of Zero-G flights describe a “post-gravity” experience, in which a feeling of “ungroundedness” leads to an appreciation that gravity is not universal and that most of the human experience has been constrained by the fact that we have been bound to Earth’s surface. This includes our approach to the design of everyday objects, which have been developed with the implicit assumption that they will be created and used in Earth gravity. Design for Weightlessness investigates the ways in which design principles and practices will need to be revised for the future of space tourism and mass space travel. Weightlessness also leads to defamiliarization of their previously Earth-bound practices, which are made strange by the absence of gravity. Without feet planted firmly on the ground, and with no sense of orientation, concepts of up and down are redundant. This renders some familiar objects useless. Things that have been historically taken for granted by designers must be revisited and revised: There is no top or bottom, no stability or balance, and almost no friction. Everyday objects that have served their purpose in Earth for many centuries, such as spoons, cups, floors, and, shoes, are either rendered redundant by weightlessness or cease to function. Staff and students at the University of Hertfordshire, across 8 art and design programmes, are responding to this unfamiliar environment by revisiting existing designed objects and imagining how they might need to be redesigned for commercial space travel. Following a workshop with the UK Space Agency, students and staff considered how designed objects within their own disciplines might fail to function in space, and sought to address these failures by adapting or replacing these existing objects with alternatives that are intended for use in microgravity. Responses so far have ranged from the practical to the symbolic, with some students focusing on the everyday, and others concerned with exploiting the opportunities for spectacle that are offered by strange new environments. Some designed entirely for microgravity, while others designed for short sub-orbital flights, with objects that could function in varying gravitational conditions. Fashion students recognised that clothes worn in space would be encountered from any angle, making the underside and aerial views of a garment just as important as silhouette view. Madison Beith designed a dress of two concentric circles, with coloured undersides that would be exposed as the wearer becomes weightless. Fashion tutor Nicola De Main was inspired by the deformation of gravitational waves as they twist into a wormhole, and designed a neckpiece that quantifies the ways in which waves are distorted by the gravity of nearby planets and other astronomical objects. The pattern, printed on laser-cut and heat-sealed layers, features a deformed grid. As the wearer travels into space, weightlessness will cause the pattern to be malformed, so that it doubles as a way of recording the precise and quantifiable distortion of the fabric. 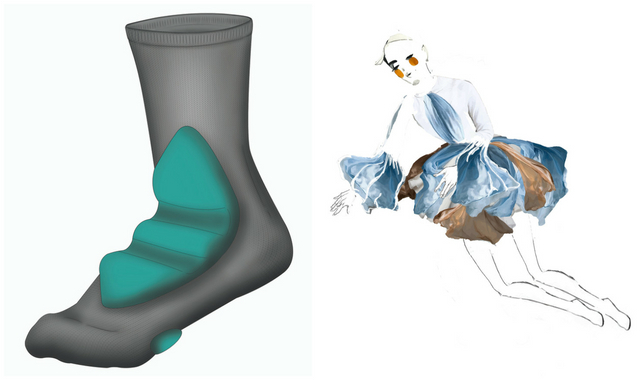 Product design student N. Dharmishta Naidu identified a need for space socks. Noting that astronauts on board the ISS don’t wear shoes, but often secure themselves by curling the tops of their toes around handrails, she designed socks with padded ridges that would protect astronauts’ feet from calluses while making it easier to grip the rails. Interior architecture students Elaine Tan Yee Lin, Leow Wey Wey  and Emily Tiu-Yee-Herng designed a world-view capsule to offer passengers a 360° view of space (image at the top of the article). Oculus brings the outside inside with holographics, so that the interior feels like space itself. While the passengers are weightless, the floor opens so that their chairs may be retracted into a storage area at the base of the craft. This leaves the main cabin free of obstructions that could hinder passengers’ experience of weightlessness. Industrial Design student Bart Lang proposes a solution to the problem of limited visibility and small windows on commercial/regular spacecraft caused by low pressure in space and high temperatures whilst leaving or entering the atmosphere. It allows travellers to be separated from the main spaceship, to float as if alone in space, while still tethered safely to the mother ship. 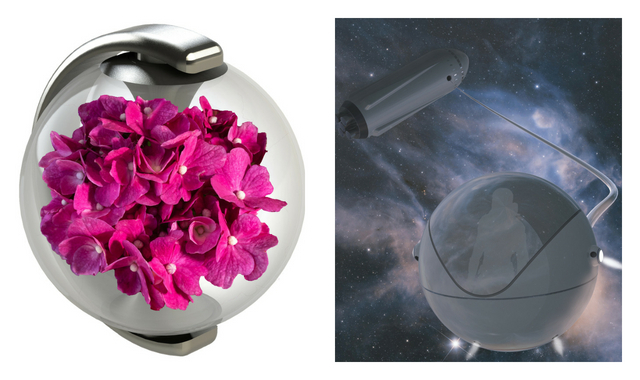 More romantic projects from Industrial Designers included Jamie Christopher Fautley’s spherical floral display, a 360-degree habitat for growing plants, that can float freely around a cabin. The School of Creative Arts is continuing the Design for Weightlessness with further research and collaborations. Having undergone these initial explorations, we seek to align ourselves more closely with the realities of designing for the commercial space sector, working with Blue Abyss for the ongoing development of the project. Selected designs will be manufactured as prototypes, and our long-term goal is to test these prototypes on board a parabolic flight. Research and testing facilities such as Blue Abyss will support development and innovation in subsea and space design activities such as the Design for Weightlessness at the University of Hertfordshire, offering students of partnering universities the opportunity to work on real-world projects in a world-class R&D centre.